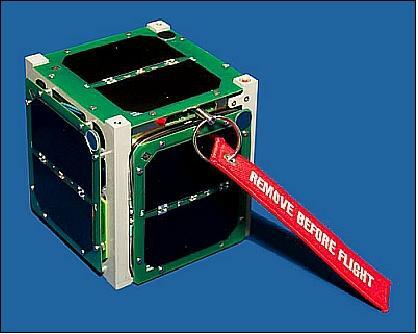 SwampSat is a 1U student-developed CubeSat mission of the University of Florida (UFL) in Gainesville, FL, USA. The goal of the project is to advance the TRL (Technology Readiness Level) of CMGs (Control Moment Gyroscopes) appropriate for smallsats, as a means of increasing the capabilities, and hence the utility of CubeSats. The intend is to demonstrate on-orbit precision three axes attitude control using a pyramidal configuration of CMGs. The launch of a Minotaur I rocket for the U.S. Air Force ORS-3 mission is scheduled to occur on November 20, 2013 from Wallops Flight Facility (WFF), Virginia, with a planned launch window from 00:30 - 02:00 UTC. The launch, from ignition to delivery of the satellites in orbit, will take a little less than twelve-and-a-half minutes, with a targeted 500 km circular orbit at an inclination of 40.5 degrees. SwampSat’s primary objective is to demonstrate a compact three-axis attitude control system that permits rapid retargeting and precision pointing capabilities for pico and nano satellites.